This versatile table cover is ideal for varying events and display options, providing a good fit on 8ft, 6ft and 4ft tables. The 8ft non-fitted style can convert to a 6ft fitted or non-fitted version, and the 6ft non-fitted style adjusts to a 4ft fitted or non-fitted version, eliminating the need to purchase two covers. 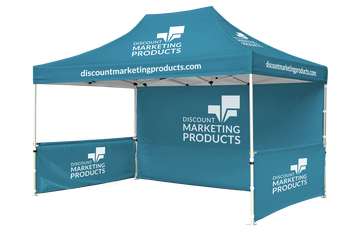 Starting as white fabric, the full color digital or dye sublimation printing allows for custom designs, backgrounds and multiple logo placements. Various screen printing options and blank covers are also available. Includes double-edge stitching along entire perimeter and a clear PVC carry bag with zipper. This table cover is available as two folding options. Option 1 (Fitted) folds back the sides, attaching to rear Velcro, for a fitted look. Option 2 (Non-fitted) folds over 12″ of fabric at the top of the left and right corners, for a non-fitted look. Option 1 does not allow for side images whereas Option 2 does accommodate side images.